It’s cold as hell in New York right now. I’ve just returned from my Morocco trip where it was a heavenly 80 plus degrees so I’m definitely not feeling the current 49 degrees with gusting winds. I honestly just want to curl up and binge watch “Crazy Rich Asians” Youtube documentaries, ( I’m waiting until I can read the books before indulging in the movie). Which I intend to do after posting this Cannabis infused tomato soup recipe I recently decided to try. Last night after a day of running errands in the cold, I broke down and made soup which in October is a bit too early but seeing as the city simply skipped Fall, I may as well transition to winter early too. 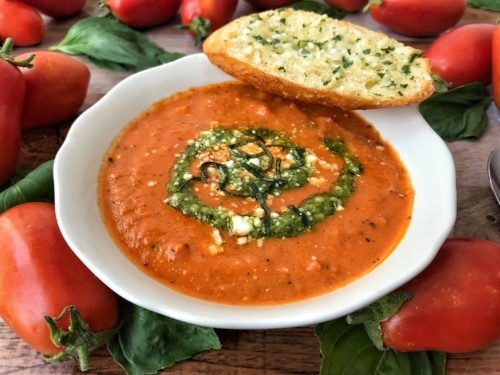 This tomato cannabis soup is so easy to prepare and basically requires no extra effort outside of traditional homemade tomato soup except the canna-oil addition. Not going to lie my current obsession with CBD and all things cannabis has recently spilled over into our new product offerings. If you don’t already have canna-oil already stashed in your kitchen cabinets, you definitely should start stocking up now if you want to continue testing out cannabis infused recipes this winter. Here’s a great source of canna-oil how-to from Munchies. In a big pot, cook the tomatoes, tomato purée, carrot, celery, lemon juice, garlic, salt, black pepper, and the Italian spices for 1 hour. The tomatoes should create a lot of liquid; if not, add some water. While the soup is cooking, sauté the onion separately in olive oil for 10 minutes, then take off the heat. Wait for 20 seconds, add the canna-oil, mix it thoroughly, and add the onions into the soup. Steam the cannabis leaves for 3–5 minutes in a separate pan right before serving the soup. 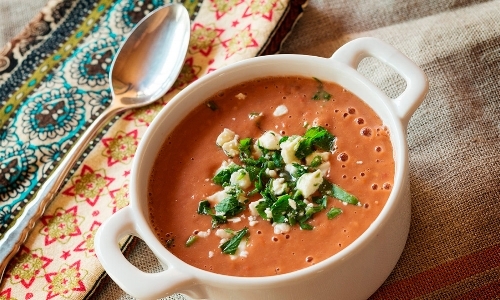 At the end of the 1 hour, add some vinegar and blend the soup in a food processor until it’s smooth and creamy. After it’s blended and poured into bowls, add some crumbled feta, fresh dill, and ornament with a steamy cannabis leaf.